Couser Cattle Company owned and operated by Bill and Nancy Couser and family at Nevada, Iowa, are national winners of the National Cattlemen's Beef Association Environmental Stewardship Award for 2011. 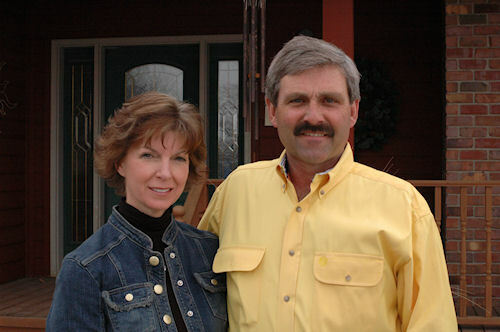 Central Iowa farmers Bill and Nancy Couser are the national 2011 winners of the Environmental Stewardship Award Program, which is organized by the National Cattlemen's Beef Association. Three generations of their family were present to receive the award Feb. 3 in Denver, Colo. The ESAP awards ceremony was part of the NCBA's 2012 annual meeting. Couser Cattle Co. is a second and third generation multifaceted farm. The Cousers annually feed and finish 5,000 to 6,000 head of cattle and grow both corn and soybeans at Nevada, Iowa. The family business philosophy centers on working to ensure that both profit opportunities and environmental performance are present in cattle and farming operations. "It is an honor to represent the cattle industry, especially the feedlot part of the industry, and help show that beef can be produced in an environmentally sustainable manner," says Bill Couser. It is unusual for a cattle feedlot operation to win this national environmental award. In recent years the winners have generally been cow-calf operations. • The Cousers partnered with USDA's Natural Resource Conservation Service, the Iowa Department of Natural Resources, Iowa State University and the U.S. Environmental Protection Agency to develop a pilot system that would use a series of vegetative treatment areas to treat feedlot runoff to an acceptable standard. After study and monitoring, the VTAs have reduced the mass of total solids, nitrogen and phosphorous by at least 75% or more. • In 2009, again partnering with DNR and ISU, the Cousers built a mono-slope style feeding building that directs rainfall away from a new pen and allows more feeding capacity without compromising the VTA system. Runoff is eliminated and the value of manure for fertilizer is preserved. • By working with other groups to test new biomass harvesters, the Cousers have transformed cornstalks and cobs into new forms of feed, fuel and bedding. The Environmental Stewardship Award recognizes cattle producers whose natural resource stewardship practices protect the environment and contribute to productivity and profitability. The goal of the program is to demonstrate sound environmental practices that are successful production practices. Award recipients are chosen based upon the systems, methods and approaches used to enhance the environment. Examples include: increasing pasture stocking rates, controlling feedlot runoff, beneficial use of manure and effluent, erosion control practices, increasing and maintaining wildlife habitat, or other enhancements to the air, land and water resources. The Cousers are the third Iowa family to be selected as national winners in the 20-year-old ESAP program. In 2000, the Craig Utesch family (Triple U Ranch) of Correctionville received the award, and they were followed in 2001 by Dave and Diane Petty (Iowa River Ranch) of Eldora. All three families were nominated by their commodity group, the Iowa Cattlemen's Association. Bill Couser says just competing for the top spot was an honor. "We've been able to meet several times with the six other nominees from around the country, and each has an interesting story about the way their families have used conservation and environmental practices on their farms." The ESAP award is sponsored by Dow AgroSciences; USDA's Natural Resources Conservation Service; the National Cattlemen's Foundation; and NCBA. The Iowa Cattlemen's Association represents 9,600 beef-producing families and associated companies dedicated to the future of Iowa's beef industry. ICA's mission is to provide its members the opportunity to enhance and further develop the beef industry in the state and the nation. During the National Cattlemen's Beef Association's Summer Conference, July 28-Aug. 1, 2010, seven cattle operations were recognized for going above and beyond the call of duty when it comes to environmental stewardship. On Feb. 3, 2011 the top award winner from the seven finalists was announced. "Farmers and ranchers are the very best stewards of the land, but through the partnerships Bill and his family have established, they have set a standard more of us should all strive to achieve. Bill and his family are a perfect example of how important it is to step outside of a comfort zone to make a positive difference in this industry," says Forrest Roberts, NCBA chief executive officer. "Bill's partnership with the Iowa Department of Natural Resources, Iowa State University and the U.S. Environmental Protection Agency resulted in innovative technologies that ultimately led to a very significant reduction in feedlot runoff." Roberts adds, "Bill Couser's efforts not only made his operation more environmentally sound but also led to improvements throughout the state of Iowa and in the entire country. Developing consensus with environmental groups and government officials isn't easy but it is necessary in order to achieve commonsense legislation and regulation."